The famous waterfall, at the moment, is in very good conditions. Loads of ice covers the rock face above Degioz village. You can park your car in front of the Church. In few minutes you are at the base. The waterfall is not dangerous for avalanches. Some minor snowslides can fall down from the slopes on the side of the main ice wall, after a heavy snowfall. Pitch 1: WI 3+/4; belay on the ice 30 m after the steep part. Pitch 2: WI 5+ (short section), many lines are possible on the main wall. Normally one climbs on the right looking at the the ice. Thin delicate short pillar not quite protectable, than easyer to the ice cave behind the second half of the wall. Belay on ice. Pitch 3: WI 5. Depending on the conditions one can climb just above the belay or in the middle of the wall (our case). 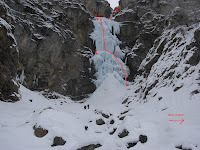 The pitch is 55m long, belay on ice. Continuos but by good technique one can exploit the ice features to relax the arms. Pitch 4: WI3. 60m. Belay in place. on the right. third rappel, from belay in place to the snow. Than continue down walking to the base crossing at first to the left in the woods (facing down).